The idea grew in me after visiting the Histon and Impington Community Orchard (HICOP): surely we could do something like this at Burnside to support our sense of community. We could follow their example and buy only local heritage fruit trees. Working together on it could create a thing of beauty for passers-by along Snakey Path and could be a good advertisement for our allotment society. I suggested it to the committee expecting someone else to take it on. This is not what happens. Anyone can propose an idea: if it is approved, the proposer works it up and leads on doing at least some of the work involved. The committee agreed a budget for 17 trees, which would fit within the site we had available, an area next to the Burnside gate. I then acquired a brochure from the East of England Apples and Orchards project (EEAOPS). I also went to the Botanical Gardens ‘Apple Day’ and put all the questions I could think of to the knowledgeable resource people there. These are all on the MM106 dwarf rootstock. We discussed these in committee, and three more were chosen and bought from a different nursery in Kent, as they were to be bigger trees, on the M25 rootstock, but also from East Anglian heritage stock. These are the Cottenham Seedling, Darcy Spice and another New Rock Pippin. The idea was that these three trees would form a shady triangle for future picnics and a delightful place to rest in the shade. The committee approved the plan and I ordered all 17 trees, which arrived on a chilly day in February 2015. Very soon the chair of the committee, the site managers and a team of volunteers planted them. We didn’t have time then to clear the ground of weeds and remnants of previous crops. 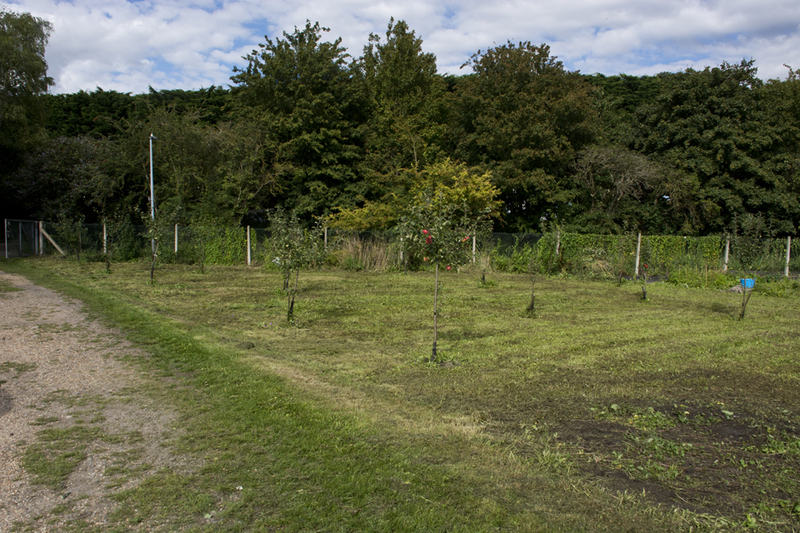 In the years between 2015 and 2019 the orchard has been largely cleared of weeds and sown with slow growing grass. 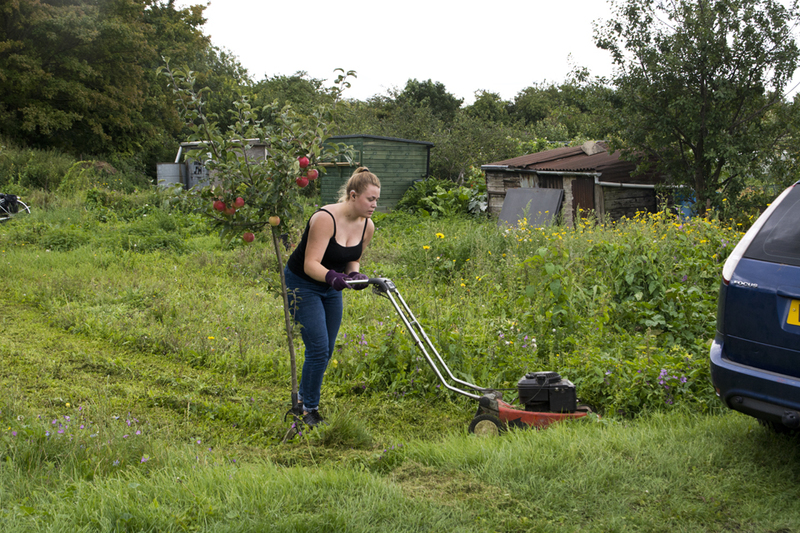 It is mown regularly by a Burnside tenant on a voluntary basis. An attempt to grow small shrubs, climbers and wild flowers along the fence has had mixed results, competing as they do with the nettles. There was a significant crop from several trees in 2018 after the hot sunny summer. At the 2019 AGM we intend to discuss fair ways to share the crops amongst interested tenants. A committee member has sourced permanent labels for the trees which record the tree variety, normal recommended picking time, and how long the produce can be expected to keep. These will be put in beside the trees shortly to indicate this information to interested tenants who plan to engage in picking. 2 eating apples (Morley’s Seedling and Wayside). The orchard area was slightly extended, and the trees for the orchard were planted within 48 hours of delivery. These are excellent bare-rooted trees, already in bud, and looking very healthy. So here we are, in February 2019, with the old and new trees in bud, looking forward to blossom that will please the insects and bees and to fruit that will please us. The orchard does indeed give interest and pleasure to those passing by: walkers often stop to chat and monitor the progress they observe. We are making a small contribution to sustaining the diversity of local heritage trees, not only through the community orchard but also through those that individual tenants have spread around both Burnside and Vinery.